In this article we consider the importance of the Solovetskie Islands for understanding of the memory of the Gulag in Russia. To better explain our argumentation we take a program we have developed for the Center for Polish-Russian Dialogue and Understanding, which in July 2017 organized a summer school for PhD students from Poland and Russia on the Solovetskie Islands. By showing the assumptions and goals of the course we explain the complexity of the memory of Soviet repressions on Solovki in particular and in Russia in general. We describe the different memory narratives of Solovki’s repressive past that are present on the islands. 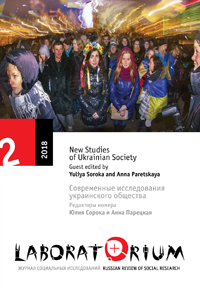 We show that to understand the memory of Soviet repressions, it is important to recognize these diverse narratives produced by different memory actors, such as activists with the nonprofit Memorial Society and the staff of the local museum, but also various representatives of the local community. It is important not only to grasp what these narratives are about but also the interrelationships between them. Voronina, Tatiana, and Zuzanna Bogumił. 2018. “Islands of One Archipelago: Narratives about the Solovetskie Islands and the Memory of Soviet Repressions”. Laboratorium: Russian Review of Social Research 10 (2), 104-21. http://soclabo.org/index.php/laboratorium/article/view/801.